The Dallas Cowboys Cheerleaders are easily the most popular and recognized cheerleading squad in all of sports. With their famous uniforms and cowgirl motif, these cheerleaders represent the Dallas Cowboys and the NFL all across the globe. Closer to home, the girls also contribute many hours to charitable events and organizations. During the 1960s, the CowBelles & Beaux cheered on the Cowboys from the sidelines. This group was comprised of high school boys and girls from the Dallas-Fort Worth area. They made their debut in 1960 and remained until 1972. Cowboys general manager Tex Schramm wanted to provide more entertainment value for the fans, so he hired professional models to grace the sidelines. Unfortunately, this did not work out well, as the models were not in suitable physical condition to cheer for three hours in the hot Texas sun. Schramm worked with local choreographer Texie Waterman and hired her to select and train a new squad of cheerleaders for the team. Sixty girls attended the first audition, and seven were chosen. 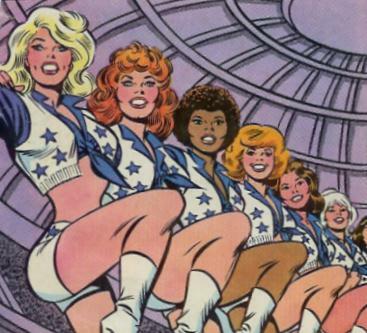 The Dallas Cowboys Cheerleaders made their debut during the 1972 NFL season. The cheerleaders really exploded in popularity in 1976. During a break in the action at Super Bowl X, a cameraman focused his lens on one of the Cowboys Cheerleaders. She gave him a wink, and 75 million viewers suddenly fell in love. Starting in 1977, the squad starting appearing on network specials and in television commercials. In 1978, they even had a one-hour special prior to the debut of Monday Night Football entitled �The 36 Most Beautiful Girls in Texas.� In 1979, a television movie titled The Dallas Cowboys Cheerleaders (starring Jane Seymour) became one of the highest-rated TV movies in history (capturing 60% of the viewing audience). In 1978, the cheerleaders also began to cultivate an international fanbase. They performed at the Mirage Bowl in Japan, and undertook a 10-day tour of the country. During this trip, Japanese men and women alike became instant fans of the leggy cheerleaders. Starting in Christmas of 1979, the cheerleaders began appearing overseas to entertain American troops. This practice continues, and the Dallas Cowboys Cheerleaders have appeared for the troops more than any other cheerleading squad. The Cowboys Cheerleaders Show Team handles the bulk of these appearances, performing a one-hour show filled with singing, dancing and numerous costume changes. In 1997, the USO presented them with the first-ever �Spirit of Hope� award for their contributions to soldiers and their families. First developed by Paula Van Waggoner, the distinctive blouse, vest and shorts of the cheerleaders are an internationally recognized symbol. Since the squad debuted in 1972, there have only been six modifications. Each uniform was hand-tailored by Ms. Leveta Crager for 24 years prior to her retirement. These duties are now handled by designer Greg Danison. Must reside in the DFW area while serving as a cheerleader. If selected, Cowboys Cheerleaders are also expected to abide by certain rules. When in uniform, cheerleaders cannot smoke, drink or engage in any other activity deemed unbecoming. The uniform can only be worn with specific permission from the Cowboys organization. Cheerleaders cannot date players, coaches or any employee of the team. Held annually, Camp DCC is for girls ages 5 to 14. There, they learn dance routines, team spirit, self-esteem and many other valuable lessons. Each session is limited to 80 participants, and select girls will also be invited to serve on the Junior Dallas Cowboys Cheerleaders Squad. This group performs all over the DFW area and appears at select Cowboys� home games. The Cowboys Cheerleaders produce an annual best-selling swimsuit calendar. The 16-month calendar is shot in a different exotic location each year, and it�s consistently the Cowboys� highest-selling souvenir. To order present and past swimsuit calendars, visit the merchandise area of the Cowboys� website. The swimsuit calendars normally sell for $9.99.